DO NOT USE YOUR PANTS SIZE. Ross Hunting Women's Sport Kilt! These are custom made, please give us 3-5 days to make 'em. If you need it rushed, let us know and we'll do our best. 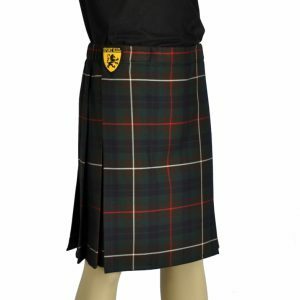 A wrap-around style women's kilt with a secure Velcro closure and elastic in the waistband for comfort and fit. Standard length is 18" long. You may also add custom options like sewn-down pleats (highly recommended), belt loops, buckle/strap closure for a custom one-of-a-kind look. Size note: small fits 22-26" waists, medium is for 27-33" large is for 34-38" waists and XL fits 38-44" waist sizes. My nephew’s sport kilt was amazing and we were so pleased with it. Mine, however, was less than stellar for me. The fit was poor and I felt terrible in it. It was both too big and too little at the same time. I have been pleased with the kids and the men’s kilts, but the women’s kilt was not for me. I would like to return it and get something that fits better. This kilt in this tartan looks awesome on the field. Love the vibrant almost spring-like green.I thank my lucky stars that my clan has such an awesome tartan. I match it with black socks and tank and it looks great. So comfy, too. Not too long, not too short. Customer service was phenomenal. I needed my kilt in a time crunch so I could throw in a upcoming games and Sport Kilt got it to me with time to spare. Will definitely be a repeat customer soon!